Dec 2012 -- This website was launched with an initial 105 Servicemen NAMES. That number continues to grow daily. MANY ServiceMen Names are being researched & ADDED to County Index pages. THANKS again to Researcher, Pat Holt Juon! And Huge Thanks to Connie Swearingen for her Woodbury & NWIowa submissions. 99 COUNTIES & number of NAMES added in APRIL. The Service Men and Women **pages are updated with additional information often, as more old news items, photos and/or bios and obituaries are found. These history items are essential in completing the stories of these individuals who served during WWII from Iowa. This website was launched befittingly on the 71st Anniv. of the United States involvement in WWII, 12/7/2012. 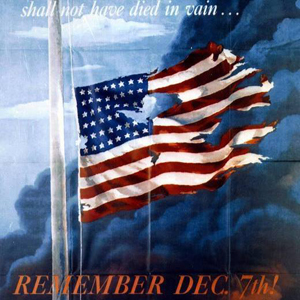 Seventy-one years ago, the Japanese attack on Pearl Harbor, Hawaii, brought the U.S. into World War II. In his address asking Congress for a declaration of war, President Franklin D. Roosevelt called Dec. 7, 1941, a date that "will live in infamy." - Added this month - Newspaper transcription data bases for the counties of Plymouth and Woodbury. Connie Swearingen has been diligently transcribing & submitting Sioux City Journal War News columns for Woodbury County. Plymouth County news issue transcriptions are typed and will soon be uploaded by Linda Ziemann. The local news kept readers informed about ServiceMen and Women during the War Years. **Special Recognition to three very dedicated WWII research volunteers! #1. Pat Holt Juon has shared her Iowa WWII Servicemen research. Every county has submissions from Pat. "Pat, what a great service you are doing by sharing all this Iowa research." As the days go forward, more & more of Pat's contributions will be on these pages! Pat has been researching & sharing all year long! #2. Terry Hirsch is also sharing and contributing Iowa in WWII research....At present most of the ServiceWomen contributions are coming from Terry. Terry is doing a fabulous job. You will see notations on this What's New page over the last year (see below) of Terry's other contributions, besides the high numbers of ServiceWomen submitted by Terry each month. **Also from August through October 2017, Terry Hirsch, researched, transcribed & submitted 165 WWII news articles about Iowans, written by Iowa native, Frank Miles, war correspondent. Miles wrote about & interviewed WWII servicemen and women from Iowa as he lived along side them in the war theater. Check this out: Iowa Daily Press War Correspondent, Frank Miles -- Read his news coverage mentioning those serving from IOWA. AND #3 Contributor is Iowa in WWII's Assistant Coordinator, Connie Swearingen. Connie submits all kinds of detail (mainly from NW Iowa). Great Work! This site's progress & content could not be accomplished without these 3 ladies and SO MANY other contributors!! !